Africa's the place and Ace is on the case, setting out to rescue an animal he loathes: a bat! Jim Carrey (Batman Forever) returns as Ace, the alligator-wrasslin', elephant-calling, monkey-shining, loogie-launching, burning coals-crossing, disguise-mastering pet detective. If you're ready to laugh like a pack of hyenas, if you want more fun than an industrial-sized barrel of monkeys, you know what to do. Heed the call. Download Ace Ventura: When Nature Calls in Digital HD from the iTunes store. 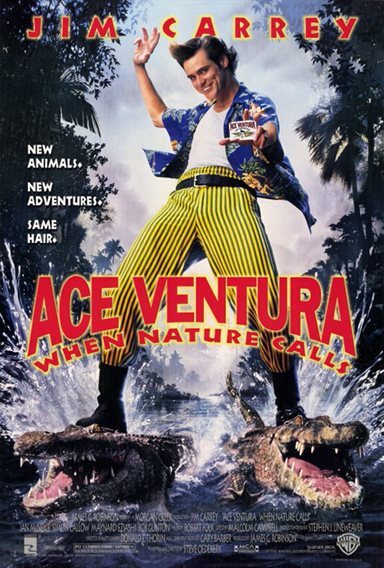 Ace Ventura: When Nature Calls images are © Warner Bros.. All Rights Reserved.